Welcome back to Survivor! Jeff Probst greets the 20 new castaways on a boat in Fiji where they learn they've been divided into tribes based on adversity and advantages: David vs. Goliath. Sure! To make sure Probst hammers home the theme, he has castaways share their stories of hardship and privilege. 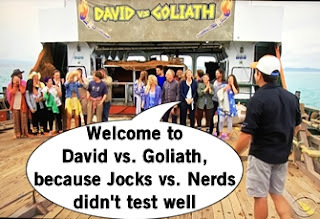 The tribal rivalry begins with a challenge featuring the two weakest Davids (Christian and Lyrsa, chosen by the Goliaths) and the two strongest Goliaths (John and Alison, chosen by the Davids). The challenge gets even more complicated by allowing the Davids to choose which tribe does which obstacles. Anyways, the Davids take home the shelter supply prize after Christian masters the slide puzzle - a skill he's all too happy to boast. The tribes are unleashed upon the ocean and off to their rainy camps. As soon as the Goliath tribe hits the beach, everyone recognizes Mike from his two stints on The Amazing Race and being a writer/actor. Superfan Mike really wants to find the Hidden Immunity Idol because it's a Survivor Bucket List item, but when he's caught looking it only puts a bigger target on him. The whole Goliath tribe becomes obsessed with finding the Idol, and in what might be the first ever flashback, it's revealed that Dan the SWAT Cop found the idol. He also might be finding love as he's smitten with Kara. Every season there's a bossy person at camp and that appears to potentially be Natalie, but maybe she's super-irking Natalia for having a similar name. Pat is the bossy, brash guy on the David tribe, but the dude knows how to make a killer shelter. Social media savvy "blerd" Davie catches an octopus and is able to feed the tribe, which is a pretty cool accomplishment for like day two. 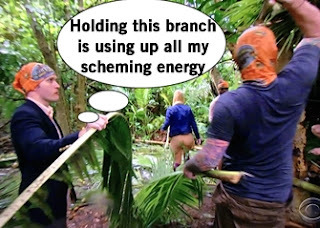 The whole tribe is putting in a lot of effort to make camp liveable, except public defender Nick who is saving his energy to make alliances. He also wants to name all his alliances which is such a Big Brother thing. But his scheming and lack of camp work is apparent and bumps him up the target list, but earns back a little bit of love after sharing his sad backstory with the tribe. Nothing like a lot of rain and sad life stories to bring about some tribal bonding. The first challenge of the season is an obstacle course followed by a giant puzzle to put numbers in order. It's a pretty close race but the Goliath tribe takes the win and avoids Tribal Council. The David tribe heads back to camp in the torrential rain, but the stormy seas take their toll. Apparently, in the boat ride back to camp, Pat was bounced extremely hard and suffers a serious back injury. 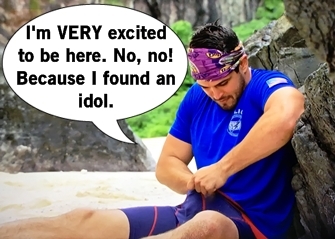 A heartbroken Pat is medevaced from the game and this seems like maybe the first of Mother Nature wreaking havoc on Survivor David vs. Goliath. Pat was robbed of glory and would have gone to the top!! Long live the toothless bad boy of the beach.